The successful events of the past two years in Israel allow us to predict and even greater event for this year of 2018/5778. This June Noahide Conference will offer a new experience to the participating Noahides. Our panel of expert Rabbis of the Noahide Academy will present new topics during the lectures and workshops. We will tour new sites in Jerusalem and travel to new inspiring places in Israel. 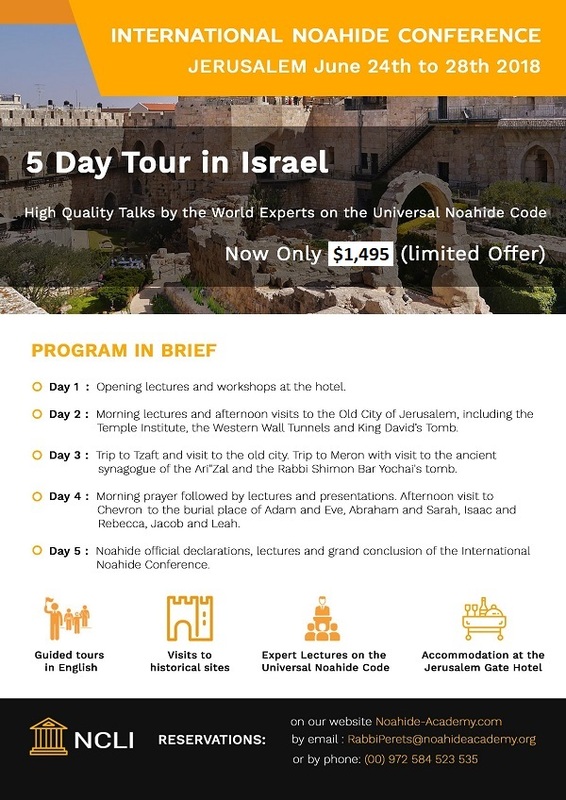 For those who will be joining us for the first time, you may be assured of feeling immersed in the Holy Land of Israel, and in the Divine Message of the Noahide Code as the guideline for a truly fulfilled life. Day 1: Opening lectures and workshops at the hotel. Day 2: Morning lectures and afternoon visits to the Old City of Jerusalem, including the Temple Institute, the Western Wall Tunnels and King David’s Tomb. Day 3: Trip to Tzaft and visit to the old city. Trip to Meron with visit to the ancient synagogue of the Ari"Zal and the Rabbi Shimon Bar Yochai's tomb. Day 4: Morning prayer followed by lectures and presentations. Afternoon visit to Chevron to the burial place of Adam and Eve, Abraham and Sarah, Isaac and Rebecca, Jacob and Leah. Day 5: Noahide official declarations, lectures and grand conclusion of the International Noahide Conference. We are available for discussing discounts on a personal basis as well. I have been reading and studying the books I purchased while I was at the 2017 Noahide Convention, and they have been immensely helpful and interesting for me. These books included "The Divine Code" by Rabbi Moshe Weiner, "The theory and Practice of Universal Ethics" by Rabbi Shimon Cowen, and "Seven Gates of Righteous Knowledge" by Rabbi Moshe Weiner & Rabbi Dr. Michael Schulman. I cannot begin to express to you how very much I enjoyed this convention, the people, the wisdom of the Rabbis (including yourself Rabbi Perets), and the enveloping fellowship with those attending. I felt a sense of belonging and identity, a peace of mind that continues to remain with me. My family and close friends have commented on how “contented” I look since my return from Israel. The convention was certainly medication for my soul. I have seen the dates for the 2018 Convention and I will be attending. Thank you again for arranging such a wonderful 2017 Noahide Convention, and I look forward to 2018." Policy for Refunding: 15 days after registration. I already paid for the Convention, but how do I registrate? Where? Here? I was a bit too early I guess, sorry about that. What to do now, or is it all okay? I have been reading and studying the books I purchased while I was at the 2017 Noahide Convention and they have been immensely helpful and interesting for me. These books included The Divine Code – Rabbi Moshe Weiner, The theory and Practice of Universal Ethics – Rabbi Shimon Cowen and Seven Gates of Righteous Knowledge – Rabbi Moshe Weiner & Rabbi Dr Michael Schulman. I cannot begin to express to you how very much I enjoyed this convention, the people, the wisdom of the Rabbis (including yourself Rabbi Perets) and the enveloping fellowship with those attending. I felt a sense of belonging and identity, a peace of mind that continues to remain with me. My family and close friends have commented on how “contented” I look since my return from Israel. The convention was certainly medication for my soul. I have seen the dates for the 2018 Convention and I will be attending. Thank you again for arranging such a wonderful 2017 Noahide Convention and I look forward to 2018. Thank you Mme Thomson for your appreciation! We are looking forward to seeing you this summer again in Jerusalem for the Third International Noahide Conference with the Help of HaShem! I have just watched the short clip and at the end it states summer and winter conference. Do you do 2 per year? I prefer winter that is all. It looks great and I would love to attend. Last year was fabulous: most insightful lectures from the Rabbis. Meeting and laughing with other friends from all over the world and receiving crystal clear guidance on a lot of questions I had in mind. It is a blessing to be together in that amazing Holy city: Jerusalem. I booked this wonderful conference for the thirth time: this year in Jerusalem G’d Willing! It was great to hear your interventions during then workshops and the special Wednesday presentations in 2016 and 2017 Anne. It will be even greater this year to have you back again at the Third International Noahide Conference here in Jerusalem as you have now assisted the Noahide Academy in the translation of the Prayer Booklet into dutch, launched the new website for the Dutch Noahide Community (together with the New facebook page) and we are looking forward to hear all about it! See you in Jerusalem… this Year! The week of the Noahide Conference in Jerusalem in 2017 was wonderful! Full of interactive workshops, nice trips, tips from wise Rabbis, and meeting other Noahides. A full agenda, and it was really worthwhile. Wouldn’t miss it for the world! Thank you so much for this wonderful opportunity! Toda raba! 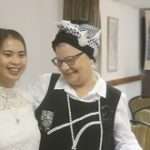 The Annual Noahide Convention in Jerusalem is a great opportunity for faithful Noahides from all over the world to personally meet and spend time with each other and with the world expert Rabbis on the field of the Torah’s Commandments for the Non-Jews, in the holy city of Jerusalem- Capital of Israel. The Convention also includes visits of the Kotel (Western Wall) and other holy places and is once-in-a-lifetime chance to get closer to G-d and to charge one’s soul with holiness and kosher spirituallity for the whole year! I had a delightful and most informative time at the first two International Noahide Conferences in Jerusalem, the Capital of Israel. The conferences were so good that I have booked to re-attend this year also. 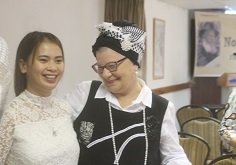 Rabbi Moshe Perets has been an amazing and most welcoming host and exceptional organiser of the conferences and has put together a wonderful and professional package. 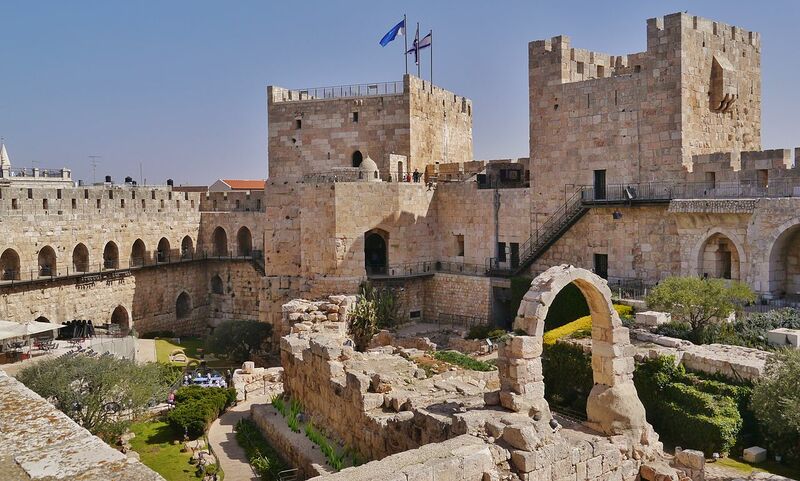 The hotel, The Jerusalem Gate Hotel is very comfortable with a nice atmosphere and great facilities and views. It is just around the corner from the Jerusalem Central Bus Station, so is in a very convenient location. You can walk from the hotel to the Old City, but there is the new Jerusalem Light Rail just around the corner in Jaffa Street that goes direct to the Old City. Rabbi Moshe Weiner, Rabbi Yitzchak Dubovick, Rabbi Dr Shimon Dovid Cowan and Dr Michoel Schulman all gave some very insightful, informative and most interesting lectures on a range of subjects relevant to observant Noahides. They also took a variety of questions from Noahides in the audience and gave very pertinent and helpful answers. It is always nice to meet the authors of the books that you have been studying. Our Tour Guide, Ariel Leshem, is a seventh generation Israeli and has an excellent local knowledge and took us to some amazing places in Israel (don’t forget to bring your swimming trunks and flip-flops, as he loves going for a swim). He is a great story teller and is able to show you the real Israel and not only what the Tourists see. It is amazing seeing and standing in the land of the bible and hearing the biblical stories and being right there in that place. All the other Noahides on the last two conferences have been amazing and we have all built up what will be lifelong friendships, and we have been able to keep in touch on Facebook ever since meeting. Some came to the previous conferences having never met another Noahide before and have left with a real sense of community. Everyone who is able should definitely come to the next conference, or at the very least save up and come a year later. It is a life changing experience coming to the Holy Land and learning with authentic Torah scholars, who know what they are talking about and are able to transmit the real Torah to you. It truly was a blessing to attend last year’s Noahide Convention in Jerusalem. We were very privileged to learn from the wise and qualified Rabbis furthermore the program offered great tours exploring the beauty of the Holy Land. I was very grateful to meet fellow Noahides for the first time, to share experiences, thoughts and visions. I pray that the light shared during this convention will help illuminate the rest of the world in truth. Does this price include flight? No it does not include flight! It includes Hotel with breakfast and dinner, tours, visits, lectures and workshops.